In the past thirty years an evolution occurred with Complete Colony Collapse (CCD). Beekeepers, bee biologists and many others struggled to pin point the cause. One of the main pests was the Varroa Destructor Mite. 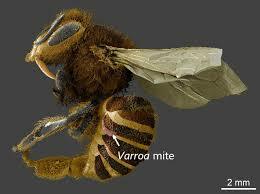 Varroa are ectoparasites that feed on the fatty tissue of immature and adult honey bees. Apis mellifera, the Western honey bee, is not the mite’s natural host. In fact, the mite is native to Asia where it parasitizes another cavity-dwelling honey bee, Apis cerana Fabricius (the eastern or Asian honey bee). Apis cerana is believed to have some natural defenses against the mite and consequently rarely is affected negatively by the mite. Only when colonies of Apis mellifera were brought to Asia did people begin to realize how devastating the mites could be. Varroa’s host shift did not occur instantly, as evidence suggests that it may have taken 50-100 years (Webster and Delaplane 2001). Since that time, the mite has spread around the world and has become nearly cosmopolitan in distribution. Those countries not hosting Varroa maintain strict quarantine procedures to lessen the chance of an accidental importation of the mite. 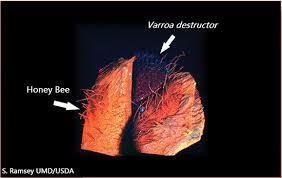 Development of the Varroa Destructor Mite is similar to other insects and mites. 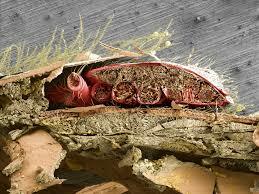 Metamorphosis stages all occur withiin the honey bee capped brood cell. Typically the female lays one male and four female eggs in a single brood cell. Only one son and 1 or two of the oldest daughters survive before the honey bee hatches from the cell. The female (mother) mite, through a steady diet derived from the prepupa provides the mite the necessary nutrition to make her eggs. The mothers body swells as the egg matures within the ovary. The first egg is laid on the wall of the honey bee brood cell before the end of the bee’s prepupal stage. Typically the first mite egg is a male. She then lays an egg every 30 hours over the succeeding days. The mother mite, potentially lays more than the 3 or 4 eggs but none of these will have sufficient time within the brood cell to mature into adults prior to the honey bee hatching. The mite ‘son’ and first ‘daughter’ reach adulthood at approximately 17-18 days of the honey bee’s metamorphosis. After molting from the dautonymph stage, the young adult mites are white. Over the next hours to days the daughters become as brown as their mothers. The adult males remain a light tan color. The adult son will then mate several times with the daughters who stores 40-70 spermatozoa with her spermatheca which she utilizes later in her cycle to fertilize her own eggs. It is believed that mites depend on touch or smell as they do not have eyes. 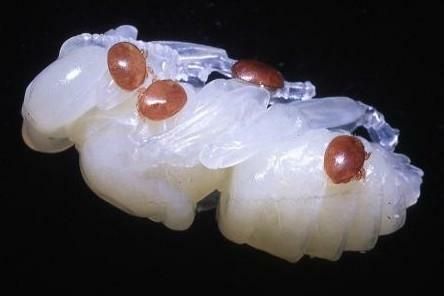 The Varroa Destructor Mite, during metamorphosis, sheds their skins twice. The first occurs as the mite moves from the protonymph to deutonymph stage. The second molt transpired as the mite transforms from the deutonumph into an adult. As the honey bee emerges from the cell the daughters are attached. The male mite typically remains in the brood cell to be killed by the nest cleaning bees as the cell is prepared for another honey bee eggs to be deposited. The mite prefers the Drone Brood Cell rather than the Worker cell as the Drone Brood development time is 23 to 24 days with the capped period being 14 to 15 days supporting improved conditions for laying the mite eggs through its metamorphosis. USDA Agricultural Research Service 27 July 2016. This critter thrives on its host, the honeybee. No host – no mite. The female “mother” mite enters the brood cell around day 8 or 9 after the honeybee queen lays her egg. If the mite had entered earlier the nurse bees would cease to care for the egg/larva discerning it as diseased. So the mother mite hides under the larva at the bottom of the cell. Once the cell is capped mom lays her first egg, a male mite. 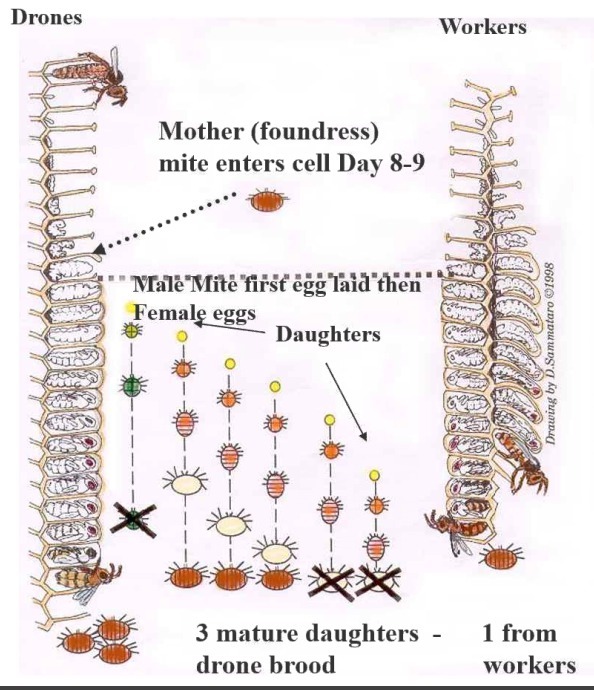 The mother then lays a succession of female mite eggs. Female mites living when brood is present in the colony have an average life expectancy of 27 days, yet in the absence of brood, they may live for many months. If the cell is a drone cell, which is larger than the worker cell, the female mite is able to succeed with more babies as the volume allows for both the drone larva and the mites. The male dies once the initial female becomes fertile. The ‘daughters’ must be nourished and survive. The mites attach themselves on the larva as it grows in hopes of thriving on the new borne honeybee. Note the picture of the drone larva with mites attached. When opening your hive you may find drone cells on the bottom of the frames. It is a good practice when opening a hive to first look at the bottom of the box frames that you may see the torn open drone cells with the larva exposed. You only have a few seconds to witness the Varroa Destructor Mite before the scurry from the light into darkness. An important function of being a ‘beekeeper’ is a keen observation, hone those skills. Not seeing the mite does not indicate a lack of infestation. The only true method is shipping three hundred bees to a laboratory capable of conducting diagnostics. But there are other methods. The ‘sugar shake test’ is currently the most accepted. Taking a mason jar pour 1/2 cup water into it. Mark the level with a permanent mark. Dry the jar. Cut some #8 mesh wire to fit inside the lid so that air and of course the powered sugar. Scoop the bees off a frame, best a brood filled frame, by moving the edge of the jar in a downward motion. The bees will fall into the jar. Continue this process until reaching the mark, which is 300 bees. Screw the lid, with wire mesh, onto the jar. Place two tablespoons of powdered sugar thru the mesh. Shake the jar to coat all the bee inside with the powder. Continue to shake the jar for several minutes. Then place the jar into the sunlight for an additional few minutes. This process should dislodge the mites attached to the bees. Shake sugar from the jar into a white plastic tub vigorously. You may reapply sugar to the bees for assurance you have dislodge the maximum number of mites. Pour some water into the tub to dissolve the sugar. Find the mites! To ascertain one look for something moving, typically red in color. You will see debris but don’t be fooled. 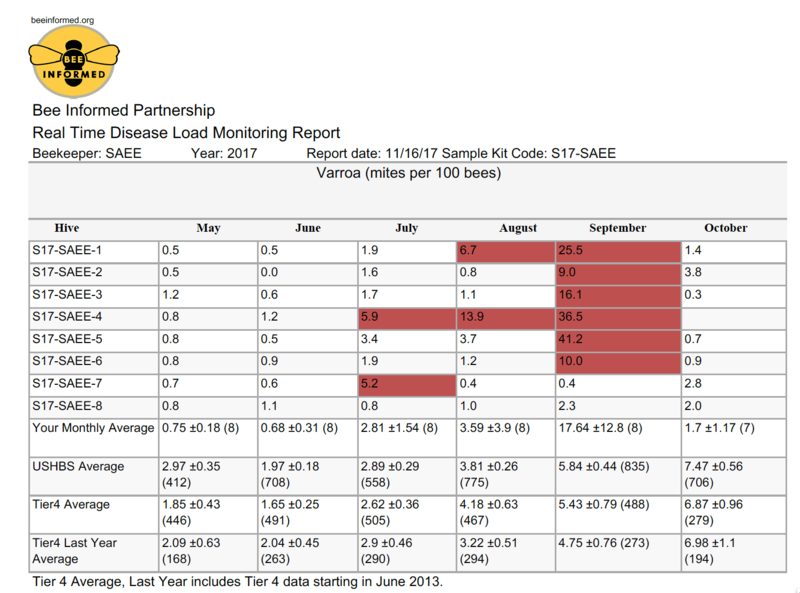 Good beekeeping management practices should include testing for the Varroa Destructor Mite on a monthly basis beginning the first month of spring through the fall season. To highlight the importance of this practice, below is a chart taken from a local apiary where Bee Informed took samples of eight hives. Note the increase in the mite levels as the season progresses. More importantly, as the bee population begins to diminish, the percent of mite infestation increases. Beekeeping is filled with choices. Different hive styles and types, foundation or foundationless, feeding sugar or not, treating for pests or not; all become individual choices we each must make. As the War Against Mites continues, the effectiveness of treatment regimes changes. Consider the path antibiotics have taken over the sixty-plus years as practitioners are now prescribing more and more powerful drugs in an effort to eliminate harmful bacteria. Beekeepers similarly are dosing their apiaries in their struggle to mitigate this powerful pest. We are in the fifth or six generation of mite treatments, as the varroa become resistant to those in the past. Key to any treatment is a thorough understanding of the instructions that accompany the mite treatment (how to use, when to use, safety). Any treatment without first sampling for the degree of infestation and conducting a followup test for effectiveness of the treatment results in poor management and ultimately resistance. Oregon State University recently published a report concerning Varroa Destructor Mite Treatment Efficacies. Honey Bee Health Coalition comprised of almost 40 organizations and agencies from across food, agriculture, government, and conservation have formed the Honey Bee Health Coalition with the goal of reversing recent declines in honey bee health and ensuring the long-term health of honey bees and other pollinators.